What is the minimum tread depth required for car tyres? What is the minimum tread depth required for car tyres? 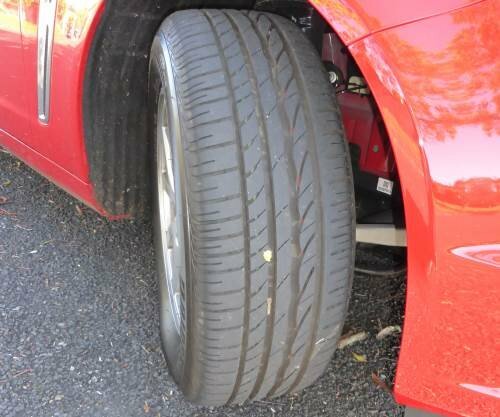 What is the minimum tread depth required for car tyres? What does tyre tread do? Tyre tread helps disperse water. If you don't have tyre tread then the tyre will ride up on top of the surface of the water, at which time you lose the majority of your grip. This is called aquaplaning or hydroplaning. When you watch motor racing you will see that in dry weather the cars have smooth slick tyres with no tyre tread (or very little tyre tread). When it rains they change them for tyres with tread. Tyres have treadwear indicators in the grooves that are 1.5mm tall. Once your tyre gets down to these blocks you know that it's well past time to get a new tyre. The optimal tyre performance in the wet is achieved when your tyres have at least 3mm tread across 85% of the tyre's width. New drivers commonly forget to check their treadwear. Different manufacturers use different tread patterns. Tread can be designed for seasonal variations in weather, for performance, or for convenience. Tyre markings on the side of the tyre tell you what the size is and what it's designed for. A generic all-weather tyre will have a mixture of lugs (blocks) and grooves. It will provide a good compromise between dry weather and wet weather driving. Wide grooves will help resist aquaplaning and will channel the water towards the edge of the tyre. If a tyre has M+S on the sidewall it is designed for light mud and snow driving, too. If a tyre is a performance tyre, it is more likely to be directional, i.e. the tyre can only be used on one side, and made of a software compound. Tyres for off road have wider grooves and deeper blocks that shed mud more easily giving more grip on softer surfaces. Extreme off-road tyres have grooves that open onto the shoulder of the tyre giving even more traction on muddy and rocky surfaces. Tyres like these have much more resistance to punctures, but are less capable on the road at higher speeds because the blocks move around more under the forces of cornering. You can see an excellent explanation of the different types of pattern on Yokohama's site here. Read our article about caring for your tyres here.